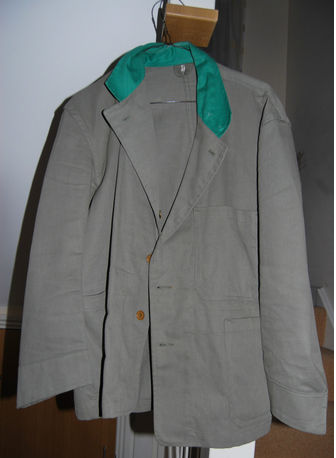 One of my blog readers has just spotted this Tilling summer dust jacket, ex-Eastern National, on Ebay. I can’t vouch for its quality but, looking at the photograph, its not bad! The auction ends on Saturday, June 30th 2012, at 10:53 so put your bid in if you’re interested. When it comes to acquiring one, these are becoming as rare as hen’s teeth. When I was looking for one, I resorted to having one made especially for me by a workwear company in Yarmouth before I was able to buy a genuine one. The down side is that it is likely to go for a fair amount of money. However, in this case, it is being sold for a good cause. Apparently the money raised will be used in the restoration of a 1950s Eastern National bus (I don’t know which one, though). No, not the building society of the same name. These two Gloucestershire towns were my twin destinations last weekend. 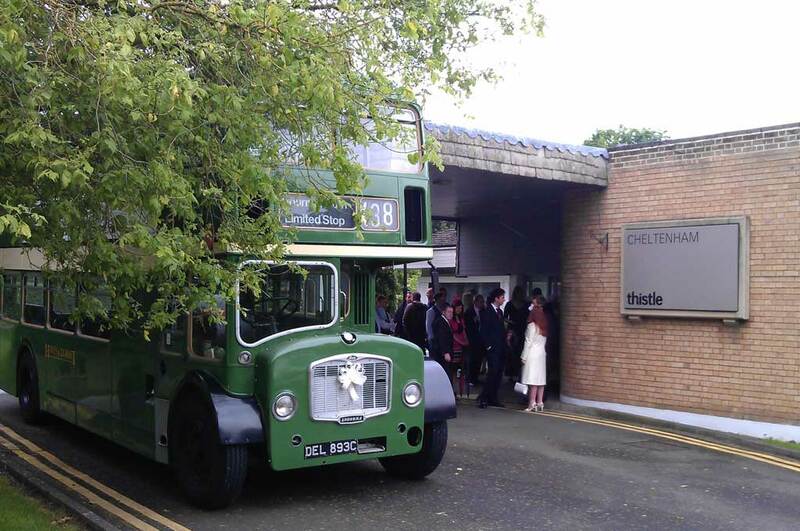 Once again I was allocated DEL893C (seems to be my regular bus) for the wedding duty which took me to Hucclecote Parish Church. Pickup time was 09:50 in Cheltenham which would have meant leaving the garage in Weston-super-Mare at about 07:15 so Mrs Busman John and I picked up the Hants & Dorset Bristol FLF on Friday evening so that I could set off for Cheltenham at a more reasonable hour! I had decided to take the direct route through Bristol as I’d discovered that it would take 8 miles off the total distance, compared with going all round the city on the M5/M4. It was a pleasant drive at that time in the evening. Rush hour had been and gone, leaving the streets nice and empty for me and my lumbering leviathan! Passing along streets that used to see many Bristol FLFs in the 1960s and 70s brought an inner sense of satisfaction, particularly when I passed what used to be the bus depot in Staple Hill. My pickup point the next morning was a hotel in Cheltenham, not far from the motorway. The drive up from Bristol, starting at a much more reasonable 08:15, was as uneventful as the terrain was flat. Gloucestershire is relatively FLF-friendly compared with Devon, which is positively mountainous in places! The FLF I had today is only powered by a Gardner 6LW which, when fully laden, feels quite underpowered if there are any gradients on the route. Thankfully there were none today and, once loaded at the hotel, I found I had seats to spare so we flew along the A40 to Gloucester at 50mph! There was only one glitch today and that was self-inflicted. For the first time since I started driving professionally, I took a wrong turn. I left one roundabout in Gloucester too early and found myself doing a tour of a singularly unattractive industrial estate. Having looked at Google Maps very intently the day before, I was hoping that if I kept going, I would eventually come out onto the road which took me to the church. As my hunch turned out to be correct you would have heard an enormous sigh of relief, if it wasn’t for the engine noise in the cab! EDIT: This page refers to the 2012 event. See this page for news of the Crosville Bus Rally 2013 or, better still, visit the rally page on the Crosville website. 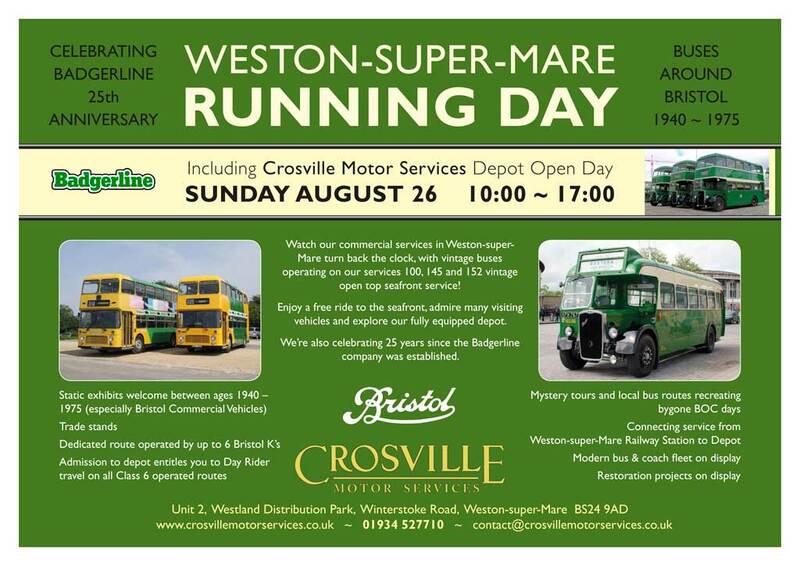 The folks at Crosville Motor Services, for whom I drive quite frequently, are putting together ambitious plans for a Running Day on Sunday August 26th. It will involve putting out every roadworthy bus in their garage, if they can find enough crews of course! That will, of course, include more than Lodekkas. Although they have been the staple diet of this blog, I’m pleased to say that other examples of the Bristol marque will be present, including K, L, MW, VR and LH. Non-Bristol vehicles may even turn up as visitors to redress the Bristol-heavy bias! The day will also include a celebration of 25 years since the local Badgerline company was established. 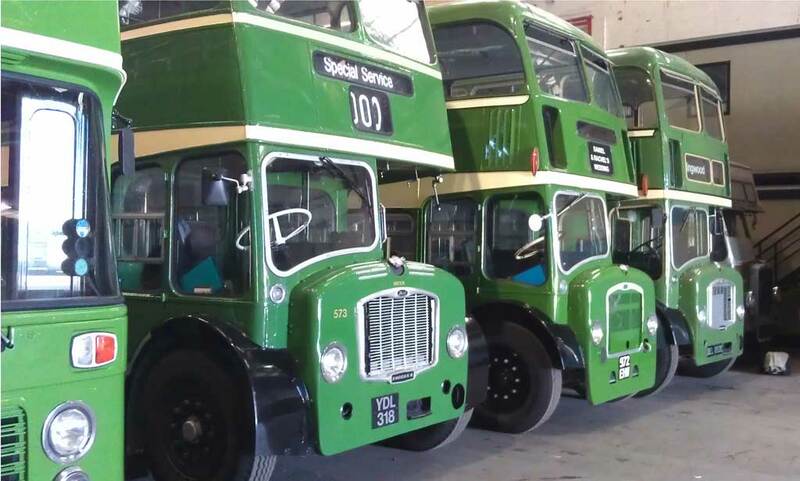 If all goes to plan, Crosville’s timetabled services 100, 145 and 152 will all be operated by heritage buses and a shuttle service, linking the depot to various parts of the town, will be operated by up to 6 Bristol Ks. Most of these will be supplied by the Bristol Omnibus Vehicle Collection, which shares garage space with Crosville’s own heritage fleet. There will be static displays, a road-making demonstration and society stalls at the depot, admission to which will be by the purchase of a programme. This also allows you unlimited travel on any of the timetabled services running on the day. Also on display will be some of the modern bus and coach fleet, together with some interesting Crosville restoration projects including an AEC Matador recovery vehicle. I’ve had great fun designing an advert for the event, which you can also download as a PDF, if you feel like printing one out. I’m sure they’d welcome any help with spreading the word! If any of you are qualified PCV drivers with crash gearbox experience or have done conducting and would like to help, please call the Crosville office on 01934 635259. I’ve got my name down for this event (how could I miss it?) and I’m secretly hoping to have a go in one of the Bristol Ks. The only down side is that it’s on a Sunday, when I’m usually to be found in church, but I’m making a special exception this time! In other news, I’m off up to Cheltenham tomorrow. No, not the races! 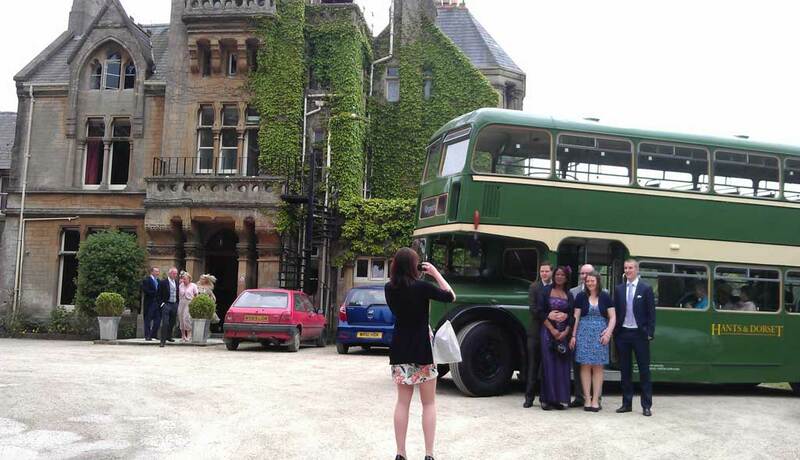 I’m out with the Hants & Dorset Bristol FLF again, providing transport for a wedding. The forecast is appalling though, so spare a thought for yours truly as I battle through wind and weather. The day following my trip to Wiltshire I was out again, this time nearer to the Crosville base. Once again it was a busy day for private hire jobs – four green Bristol Lodekkas left the depot on wedding duties almost at the same time! A driver colleague usually helps me to top up the coolant on the Hants & Dorset Bristol FLF when I take it out but today he was preparing a Bristol FS of his own so it fell to me to find a way to do it single handed. As you may have read in a previous post, the method of topping up the coolant on a Cave-Brown-Cave cooling system at this garage is usually a 2-man job. One sits in the cab and runs the engine at about half revs while the other slowly fills the header tank until no more will go in. I used a bit of ingenuity (or possibly ‘engine-uity’) and found an empty bottle of a suitable size in the garage and jammed it between the handbrake lever and the accelerator pedal. This kept the engine revs up while I went round the front with a can of water. I followed a Southern Vectis FS6G and a Bath Services LD6G out of the depot and through the outskirts of Weston-super-Mare. We parted company at a roundabout when they headed towards Wells and I took the A370 to Bristol. As I went up through the gears I listened to the satisfying clatter of the Gardner 6LW diesel engine beside me. It would be working extremely hard later but for now I just enjoyed the familiar 6-cylinder rhythm which assaulted my left ear. It may be a form of conditioning that began in my boyhood but I much prefer the sound of a 6LW to that of a 5LW. When I drove a 1950 Bristol L5G a few weeks ago, although a privilege to be entrusted with such a venerable vehicle, its strangely ‘lumpy’ 5-cylinder rhythm was not as satisfying to listen to as the more even beat of the 6LW. Does that sound daft? Entering Bristol near the Cumberland Basin I cut across towards Temple Meads station and turned south again towards Brislington. Was I being drawn as if by some ghostly force to the birthplace of the chassis beneath me? I don’t think so. It just happened to be the designated pickup point for the wedding party I was due to collect! 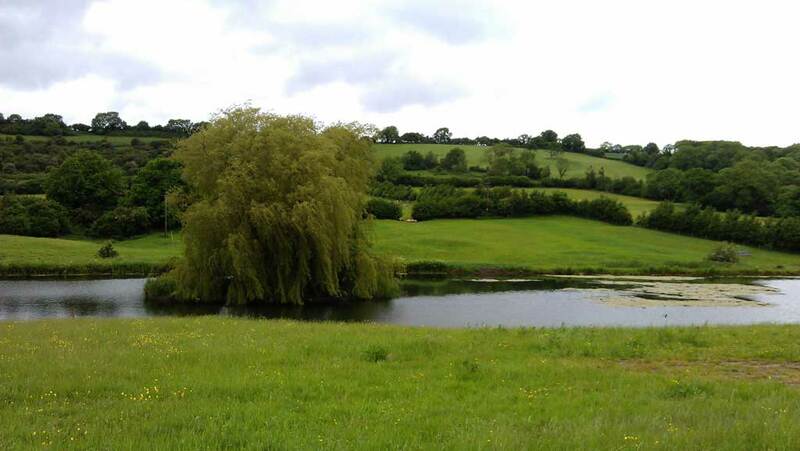 Last Saturday’s wedding hire job to Corsham, Wiltshire was possibly my longest duty yet. But, despite driving many empty miles there and back from Weston, it was by far the most enjoyable driving job so far. Two other Bristol Lodekkas were being prepared for another wedding duty as I checked over my FLF at the Crosville Motor Services depot early in the morning. I had a long drive ahead of me and the route I had chosen brought mixed blessings. Although more direct, the A368 towards Bath was slow and twisty, despite it being an ‘A’ road. This required lots of hauling on the large steering wheel and plenty of gearchange practice! The most pleasant aspect was that, being the Queen’s Diamond Jubilee weekend, all the little villages were decked out with flags and bunting. People were out and about in their gardens, already in festive mood, waving to me as I passed by. I kept checking my 1950’s wristwatch (I only wear it when I’m ‘on the buses’) as the long journey progressed, unsure whether I would make it in time for the first pickup. Following the main road through Bath was relatively painless and, after climbing through the village of Box (famous for the elaborate GWR tunnel portals nearby) I arrived at the Guyers House Hotel with half an hour to spare. The bride’s father, the groom and four immaculately dressed ushers boarded the bus and I took them into Corsham for lunch. I drove empty to the Rudloe Hall Hotel (pictured above) where I took my lunch break while waiting for some of the guests to board. As on previous occasions, I had checked out the access to this venue on Google Street View and the main entrance seemed to be obscured by low hanging branches. During the previous week I had emailed the hotel to ask if there was another, more suitable entrance. Fortunately there was, the reply told me, completed after the Street View images were taken. The short drive back into Corsham village took only 5 minutes or so and the guests walked the short distance down a lane to St Bartholomew’s Church, where the wedding was to take place. Although I hadn’t ever been to Corsham before, I was becoming familiar with its main roads as I left the village once more and drove the 8ft-wide FLF up the narrow driveway to the Guyers House Hotel again. This time the bus filled to capacity as yet more guests poured out of the courtyard and into the car park where I waited. This was obviously a large and opulent affair, with no expense spared. Steering, acceleration (if you can call it that) and braking were noticeably different with a full load and I was glad I didn’t to have to negotiate any steep gradients! There were yet more guests to transfer to the church so it was a case of ‘pedal to the metal’ back to the hotel for another load. In the nick of time, they were delivered to the church. I drove round the town and found a quiet street to park up and kill some time. Returning to the High Street, I parked near the church and waited for the guests to re-appear.